I’ve pretty much steered clear of the cake pop craze, mostly because of all the fussy work that cake pops require. I know that there are electric cake pop makers and special two-part pans to help make the job easier, but they weren’t enough to lure me. Then…a friend told me about using already-made donut holes for the job, which seemed like a GREAT idea. I bought a box of Entenmann’s Glazed Pop’ems, some lollipop sticks and a bag of Wilton white chocolate candy melts, and I was off and running. Before inserting the stick into the pop-em, I dipped it into the melted chocolate to help secure it. Next, holding the stick, I dipped the donut hole into the chocolate, rolled it in sprinkles, and then stuck it into a piece of styrofoam so that it would dry upright. I spray painted a small, tin pail white. 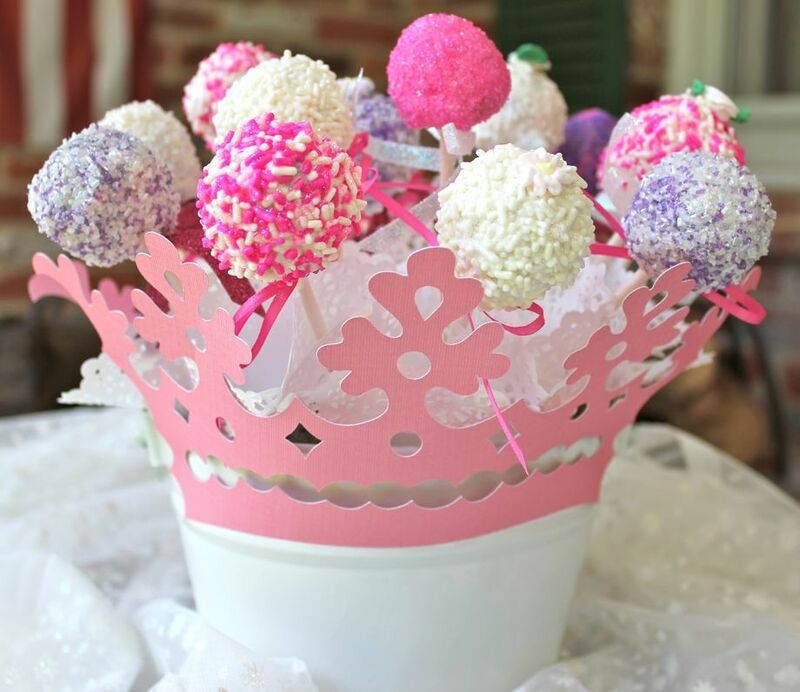 I filled the pail with large styrofoam pieces (some had to be cut to fit) and then arranged the cake pops. To cover the styrofoam, I used a dab of hot glue on 4″ doilies and stuck them in between the pops. 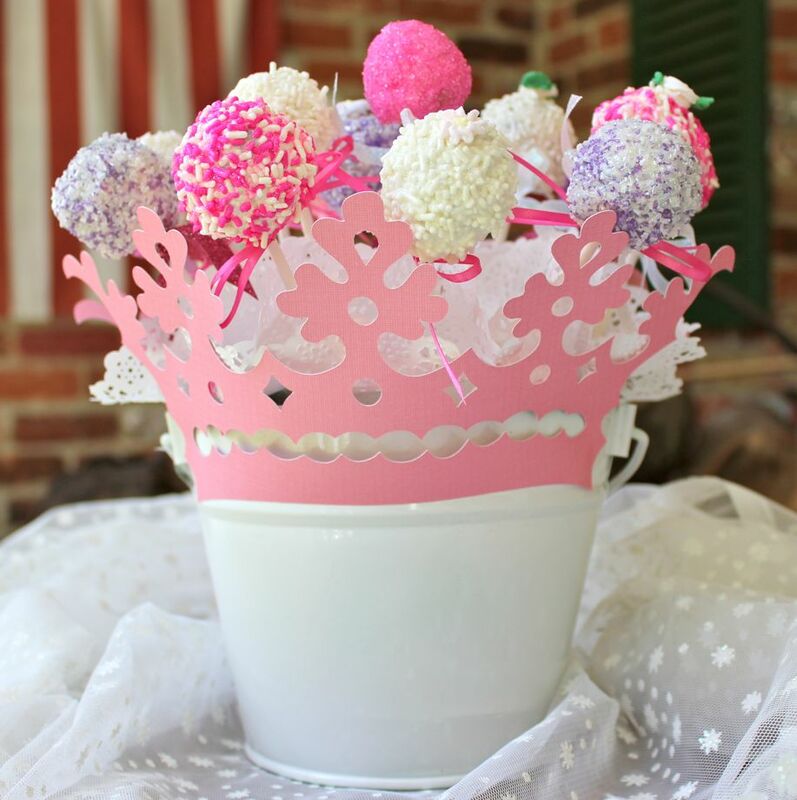 I decorated the outside of the pail with two 5″ paper crowns that I cut with the Cricut, from the “Home Decor” cartridge. Hey Sis! You never cease to amaze me! How totally adorable and what a great speedy tip! 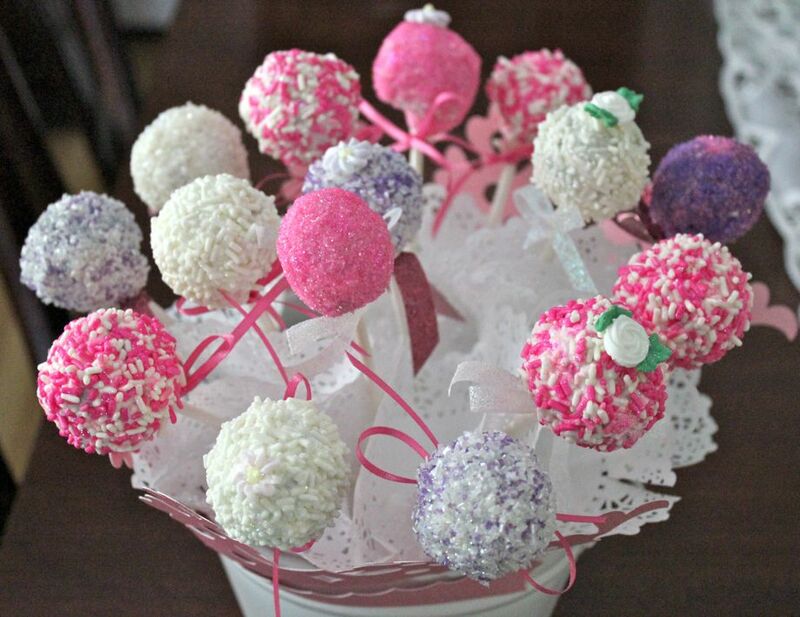 I am actually going to try it becuase I have bought several cake pop kits and every time I read the directions, I place it back in the box and close the drawer. There are 2 little boys I am going to surprise……. can you guess who???? I think those two little boys would totally LOVE these!! I hear that Dunkin’ Munchkins would work well too…probably the cake-y ones.